What else should you do during a heat wave but write about drinking? Tourists used to think that the two national beverages of Greece were retsina and ouzo. Nowadays, however, many tourists have never even heard of retsina. Retsina is a white wine flavoured with pine resin (originally this resin helped preserve the wine). It is a light wine with a slight bitter taste, which makes it a wonderful drink during the heat. Fashions change, including for drinks. Retsina has lost its popularity and has become more or less a folkloric beverage, despised by most tourists. It is beer they favour, and gaining popularity amongst Greeks too. Dutch brands like Heineken and Amstel appear more often on the table than the Greek made Mythos and Alpha. But there is also ordinary wine. Some tavernas serve home made local vintages, but the taste can be a little too acidic. Seldom will you be given a separate wine list and the wine that is offered is of medium range quality. But that is going to change. After many centuries Greek quality wines are on the rise again and are being voted best at international competitions. Greek wine was very popular in Antiquity and there was a lively wine commerce, which reached far across European borders. Writers like Theophrastus (ca. 371 – 287 BC) and Homer (ca. 800 – 750 BC) wrote priceless details about wine production and trade in their times. Homer wrote so often about wine that a friend called him Vinesos Homerus (wine nose Homer). The Greeks cannot claim to have invented wine, but it is said that Greek conquerors did bring viticulture first to Italy and then to France. Later on the Romans spread it further throughout their world. But wine is much older than the way to Rome (a Dutch expression). Ever since the merry god Dionysus offered it to the people, Greek mythology has been full of anecdotes about how sweet the wine can be, but also how treacherous. The old story goes that Dionysos taught an Athenian, Ikarios, how to make wine. When Ikarios offered some peasants a couple of cups of they got drunk and thought Ikarios was poisoning them. So they stoned him to death. The next morning they hid his body, but the dead man’s dog Maira showed his daughter Erigone where the body was. Erigone was so upset about her father’s death that she hanged herself. The dog Maira jumped into a well. Dionysus was very angry about all this and immortalised the three — Maira, Erigone and Ikarios — amongst the stars, then, as punishment, created a drought over the whole country and for Athens a plague of suicides: many young girls hanged themselves, just like Erigone. It is said that Dionysos drank just three cups of wine a day: the first for health, the second for love and the third for sleep. The myth proceeds: the fourth cup is for violence, the fifth is revolt, the sixth for drunkenness, the seventh for black eyes, the eighth for the police, the ninth for billiousness and the tenth for madness. In Roman times on the island Lesvorian wine was still famous and treasured, but after the Romans left, the great days of Lesvorian viticulture came to an end. And in the rest of the country, the golden centuries of Greek wine culture were numbered when the Greek states became part of the Byzantine Empire. The farmers had to pay more and more taxes and abandoned many vineyards. The monasteries took advantage, and monks bought up vineyards and specialized in making wine. After occupation by Franks and Venetians, the Ottomans ruled over Greece for several centuries and they were not wine lovers. The Greeks eventually freed themselves from Ottomans control, but the twentieth century proved unstable as national and international wars raged across the country: not a good time to build up viticulture. And then there was the devastatiing disease philloxera which destroyed many vineyards all across Europe, including Greece. Not until the 1960s did Greek viticulture emerge from the ruins as retsina became very popular and wine houses put plenty of cheap wine on the market. In the seventies more wineries started and made better quality wines. A trend that continues now. Greece can be proud of its improving wine culture and some farmers are even trying to reintroduce the old grape varieties from Antiquity. In the fourth century BC the most expensive wine traded in Athens was from Chios. But high quality wines also came from Lesvos, Kos, Naxos, Skopelos, Tasos and Chalkidiki. The most famous Lesvorian wine from Antiquity was Pramnian. These days it wouldn’t be thought of as a table wine at all, because it was sweet and thick as nectar. 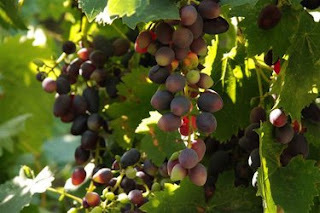 The grapes were harvested as late as possible to maximise their sugar content. They were then put in a container and, under their own weight, without the need for a wine press, they yielded a thick and sweet juice which ran free. It wasn’t until 1985 that the family of Dimitris Lambrou reopened a winery on the island to make the wine Methimneos. They revived the old Lesvorian grape (Lesvos Grape Variety) and made it in the small village of Chidira — where they now bottle both red and white wines. The red is fresh and fruity, but expensive. The white isn’t cheap either, but it’s a fresh, dry and spicy wine. Lots of Lesvorians make wine for their own use. The island has a perfect environment for viticulture: lots of volcanic earth and plenty of sunshine. These young local wines are often a little acidic, but sometimes you taste one and want to ask for a whole barrel — except that these days, home wine makers preserve the wine in plastic containers, not in wooden barrels, which I think means they miss the opportunity to make really good wine. My favorite (white) wine comes from the neighbouring island of Lemnos. I do know that alcoholic beverages do not cool you down during heat waves. But when you drink enough water in between and you remember the 10 wine rules of Dionysos, nothing bad will happen. And by the way, the most common drink on this island is water. Not just because the island is rich in water springs (which all taste different) but because there is a lot of water in daily Greek life: tables laid out with food are always decorated with the bottles of water (also plastic these days) and when you are served with a coffee, an ouzo or a whisky, you always get a glass of water. Now that wine is becoming more and more popular it might be a good custom to serve water with your glass of wine.